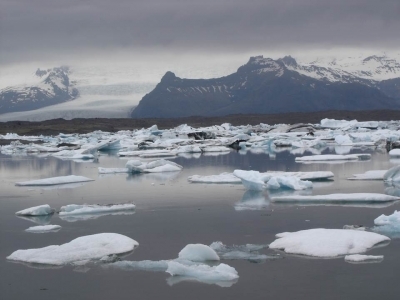 Vatnajökull National Park is part of the Tentative list of Iceland in order to qualify for inclusion in the World Heritage List. 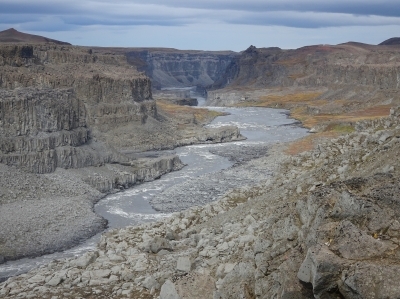 The Vatnajökull National Park area is a bit unusual, as it includes the Jökulsargljufur National Park, which has no borders to the rest of the park, creating a second location for the site. Having just visited this exclave, I can highly recommend it. It features some of the most spectacular scenery in a country overflowing with great landscapes. The glacier-fed river Jökulsa a Fjöllum (which orginates a long way down south in the main park area) is cutting through a landscape formed by raw volcanic rock. It creates a large canyon and tumbles down a series of waterfalls, including the mighty Dettifoss waterfall. It's a gripping display of raw elementary powers, with hardly any plant life or greenery in sight. Getting there is not too tough if you have a car, although the east side road is a bit rough (though probably a bit more rewarding). No 4x4 is needed, at least in summer. However, getting there as a day trip from Reykyavik is definitely out of the question. Most people do it as part of an Iceland round trip on the ring road 1, where the 2-3 hour detour is certainly worth it. Visiting in early autumn, there was no lack of tourists, but the large scale landscape could cope with it pretty well. Further north lies the Asbyrgi canyon, which is more fertile but less spectacular, but still highly enjoyable. For the Skaftafell section in the south, I had good luck with the Jökulsarlon glacier lagoon, as there were lots of colorful icebergs floating right next to the car park, with a boat ride not really needed. There were lots of clouds and fog in the higher glacier regions, though, so the whole travel experience here relies a good bit on luck. All in all, the Vatnajökull National Park is so large and so full of marvelous landscapes that a WHS designation seems quite deserved. Iceland has so far no natural WHS that covers its amazing landscape, so it's about time. When we booked a late-availability and heavily discounted expedition cruise from Scotland to Greenland in June 2010 it included a number of organised "tourist" side trips in the Faeroes and Iceland. Argo's review below, and with it the realisation that we may soon gain an extra "visit tick" from the potential inscription of Vatnajokull NP, have led me to re-evaluate our visit there. It turns out that 2 of the Icelandic trips did indeed go inside the current boundaries of Vatnajokull NP - first, a self-drive snowmobile ride up on the glacier and second, a boat trip on (Lake) Jökulsárlón (Here is a map of the 2017 NP extension which brought the southern part of Jökulsárlón and Highway 1 which goes past it, “inside” the NP and hence “inside” the nominated area). I accept that we normally tend to be too “penny pinching” for our own good when travelling! This particularly applies for what might be termed “optional costs” such as commercially run tours. So, “HOW MUCH!!? ?” is our usual first response when discovering their cost - probably followed by us walking away, having decided that it just wouldn’t be worth it (we don’t normally “enjoy” the group aspect of organised tours anyway)! 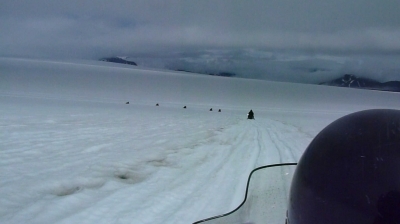 I have just checked the current price of a similar snowmobile trip to ours - this is c EUR 200/£178 per person for 3 hours including a drive up from Highway 1 and back, kitting/de-kitting time etc – so only 1 hour out on the ice. There is NO way we would "optionally" have paid that so, looking back, it was lucky that it was “hidden” from us in the overall cost because, both at the time and in retrospect, it proved a "memorable" experience! I cannot report the same enthusiasm for the boat trip on Jökulsárlón. This, in all honesty, was a bit “dull”. You climb onto an amphibious truck (current cost c£41 or Eur 46) which then trundles into the lake and slowly navigates between the “icebergs”. Perhaps we were too “blasé” about icebergs, having already been to the Antarctic and Spitzbergen where we travelled on, the far more "fun", zodiacs, but these "icebergs" really were hardly worth the name! The pictures in the tour company's web site above, show reasonably interesting shapes of a reasonable size - but ours were more like those shown in Argo's photo below! If this might be the only time you will ever be able to "navigate" among "lumps" of ice then your judgement might (justifiably) be different but I am not sure we gained much over just viewing the lake, its "icebergs" and the glacier behind it from the land. So, if we were ever to return to Iceland (2 visits already so “unlikely”), we would try to invest our time on some trekking within the NP rather than such a relatively expensive "joy ride". Having read that Iceland would propose this site for 2019, I crossed check the detailed map of the nomination file (that can be downloaded from the National Park website) with my notes and pictures from our June 2008 trip to Iceland. To be fair this tentative site is probably best visited if you go there for trekking, and this is not what we did at that time, however we went to some easily accessible parts of the nominated area. There is only one road which goes (on a short section) through this area, that is road number 1, which is also the only road going around the island. We stopped at the place called Jokulsarlon. This is a lake created by melting ice from the glacier, directly connected to the beach and sea by a short stream. There were few visitors on that day, and the dark clouds, low light, white and blue ices with the glacier in the background created a very special and impressive atmosphere we will never forget. Following road number one to Reikjavik, we also stopped at two more places (Skaftafell and Svinafellsokull) where ice tongues from the Vatnajokul glacier can be seen from very close. For this, you must exit the main road and drive for a few minutes on dust roads (accessible with our basic rental car). Staying safe on the path we walked along the ice, and again these were memorable experiences. Glacier was huge and could be seen from very close. It is even more impressive when you look at the map and realize that these are only small parts of the whole glacier which lies on top of the mountain. These places are a long drive away from the capital and we chose to do it in two days, however road number one, for being the only one, is a good road, with very low traffic. Landscape was amazing (that’s Iceland), and only stops to take pictures may cause (long) delay!